History is never quite as far away as we think it is. Russ has since passed away, but Esther Walbert, a beloved Sutherland resident is still going strong! After grandparents Carl John and Betsy Danielson, and parents Ernest and Cora Danielson, Russell and Esther’s story is a third generation history of this family. 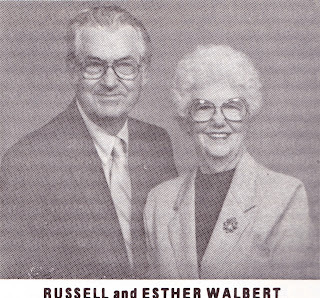 Russell and Esther met while Esther was working as a civilian secretary for the Statistical Air Control Center at Hill Field Air Base at Ogden, Utah. Russ was sent to Hill Field after 28 months overseas in the Army Air Force. Russ was born June 25, 1916, in Allentown, Pennsylvania. His parents were Clayton and Pearle Walbert. Esther was born January 22, 1918, in Sutherland, Nebraska. Her parents were Ernest and Cora (White) Danielson. 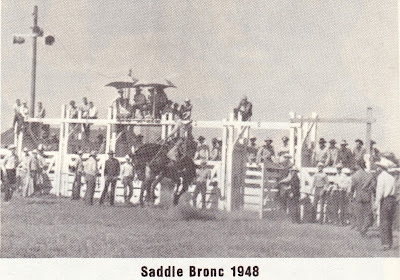 She graduated from Sutherland High School in 1936. 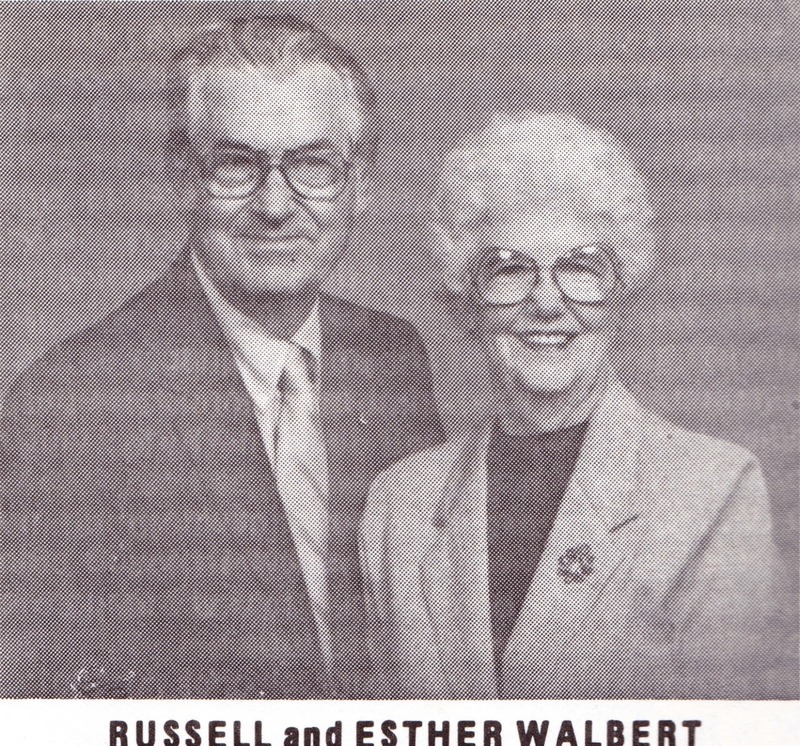 Russ and Esther were married August 11, 1945, in the Methodist Church in Ogden, Utah. Russ was discharged in October of 1945, and the couple returned to Bethlehem, Pennsylvania, where Russ worked for the Bethlehem Steel Company. They moved to Sutherland in June 1948 and Russ did painting and paper hanging. He was substitute rural mail carrier for 13 years. He helped organize the Cub Scouts, and was Cubmaster and Scoutmaster for several years. Their son, Dale, was one of four boys who received the God and Country award and Scouting’s highest award, the Eagle Badge. Russ is a member of the United Methodist Church and has held several offices in the church. He is also a member of the American Legion, D.A.V. 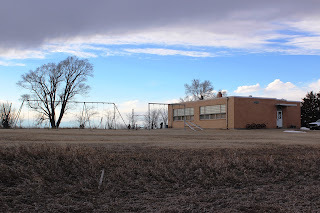 of North Platte, and Sutherland Lions Club. Russ is vice-president of the Senior Citizens of Sutherland, helping to purchase a building for their use. The Walberts owned Sno-A-White for six years and hired school students. Russ and Esther hosted the first exchange student in Sutherland. Anders Johnsson, from Molndal, Sweden, lived with the family during the 1972-73 school year. The Walberts visited Anders and his family in Sweden, and the next year, Anders and his family visited the Walberts in Sutherland. Russ retired from the Union Pacific Railroad as yardmaster with 30 years’ service. Esther began playing organ for the United Methodist Church in 1953, giving 37 years of service and still plays part-time. She is a 50-year member of the United Methodist Church, and has held several offices in the church, now serving as president of the United Methodist Women, and a member of the Bible Study Group. Esther belongs to the American Legion Auxiliary and has served on the Election Board since 1956. She is a member of Wednesday Bridge Club, and is now serving on the Centennial Board. Esther was a Den Mother for Cub Scouts and a 4-H Leader with several girls from her group winning state awards. Son, Dale, was born April 21, 1946, at Bethlehem, Pennsylvania. He graduated from Sutherland High School in 1965. Dale and his wife Sandra, have four children, Dale, Jr., Jeffrey, Karl and Toni. They live in Modesto, California. Daughter, Anita, was born July 6, 1951 in Sutherland. She graduated from Sutherland High School in 1969. Anita, her husband Jack, have his two boys, Randy and Ronny, now in military service, and Anita’s boys, Russell and Justin. They live in Raymond, Nebraska. During the years, the family has enjoyed camping, boating and traveling. After Russ’ retirement, they have done some traveling with their trailer, going south for the winters. Russell C. Walbert died on December 14th, 1998 at the age of 82. Russell was buried at Fort Mcpherson National Cemetery in Maxwell, Nebraska and was a veteran of World War II.